South Korea is the latest U.S. ally to join the China-led Asian Infrastructure Investment Bank (AIIB). On Thursday, South Korea confirmed its intention to join the Asian Infrastructure Investment Bank (AIIB). The AIIB, an international financial institution conceived of and led by the People’s Republic of China, has generated a fair bit of controversy recently due to the the United States’ public opposition to its traditional allies and partners signing on to the bank. With South Korea’s announcement, another major U.S. ally has deemed it beneficial to join the burgeoning AIIB. In recent weeks, several U.S.-aligned states, including the United Kingdom, France, Germany, and Italy, have joined the AIIB ahead of a March 31 deadline for receiving “founding member” status. Australia, another major Asia-Pacific economy and U.S. ally, is considering joining the AIIB as well, provided certain conditions are met. Following Seoul’s announcement on Thursday, shares in South Korean iron and steel companies rose amid expectations that South Korea’s AIIB participation would be a boon to these industries. 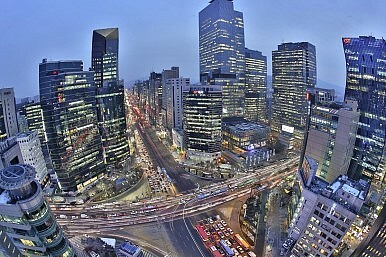 An official in the South Korean finance ministry additionally noted that Seoul’s AIIB participation would also benefit several other sectors, including communications, transport, and energy. Seoul will join the AIIB as a founding member by ratifying the bank’s articles of agreement. The Chinese Ministry of Finance will allow any state which ratifies the articles by the end-of-March deadline to sign on as a “founding” member — a distinction that could lead to advantageous influence in the bank as the institution grows and matures. Currently, 27 states are signed on to be founding members. The AIIB, despite U.S. grievances, addresses a major shortcoming in the supply of easy-to-acquire infrastructure financing for developing Asian states outside of the established rubric of the U.S.-dominated World Bank, and the U.S.- and Japan-dominated Asian Development Bank. The AIIB, which will launch with $50 billion in capital, won’t immediately fill the supply deficit but will greatly increase developing states’ ability to access credit. Part of the United States’ anxiety about the bank, at least according to U.S. Treasury Secretary Jack Lew, is due to the bank’s poor governance standards and lack of compliance with established global lending norms. Lew’s concerns mask greater U.S. worries about the viability of new international institutions that purport to exclude the United States entirely while subsuming U.S. allies. The bank’s main “competitors” — the World Bank and the Asian Development Bank — note the necessity of a new institution like the AIIB to address important gaps in regional lending. Jim Yong Kim, the current World Bank president, welcomed the AIIB last year. The ADB’s Japanese president, Takehiko Nakao, noted that the creation of the AIIB was “understandable” given regional realities. The AIIB would mark China’s first foray into seriously leading and managing the growth of what could turn out to be an important global institution. The AIIB’s launch offers a small preview into the tension between the United States and China when it comes to issues of global governance — tensions that will likely intensify as China’s rise continues over the 21st century.